Moumen Youssef is an undergraduate student studying environmental science at Carleton University. 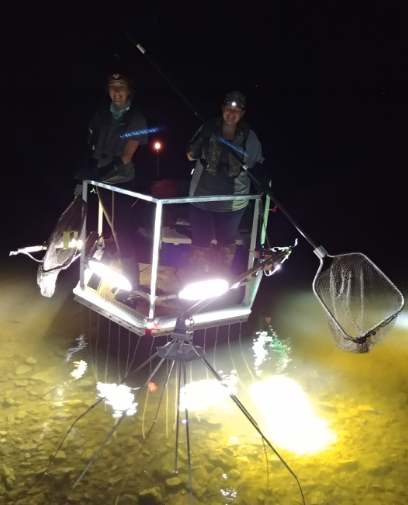 As part of his studies, he assisted with field work for FECPL’s collaborative project examining American Eel migration on the Ottawa River. Below, he provides an overview of the American Eel’s life history and the project’s objectives. The American Eel is a native fish to Ontario with a life history strategy known as catadromy. Catadromous fish are born in saltwater and migrate to freshwater environments as juveniles to grow into adults. Once mature, they migrate and return to the ocean to spawn. For the American Eel specifically, the starting point of this migration is in the Sargasso Sea, close to Bermuda. From there, larvae develop as they float with ocean currents and eventually swim up rivers along the east coast of North America, including the St. Lawrence and eventually, the Ottawa River. Unfortunately, the American Eel was assessed and listed as endangered in Ontario in 2008. Hydroelectric dams are the largest known cause of eel mortality in freshwater ecosystems. These dams impede the migration of juvenile eel coming from the Sargasso Sea and the downstream migration of adult eel returning to the ocean. Energy Ottawa’s Chaudière Falls Hydroelectric Station has installed an eel by-pass to allow the safe passage of adult eels downstream past the dam. 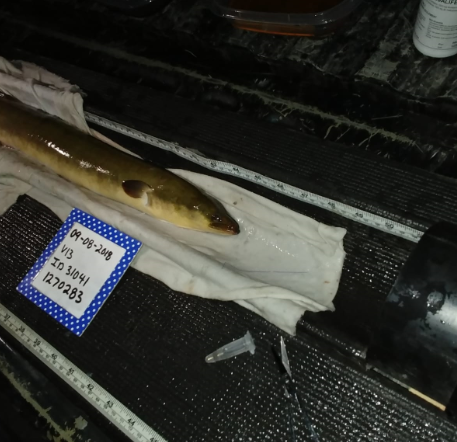 In partnership with the Canadian Wildlife Federation and Energy Ottawa, the Cooke Lab at Carleton University is testing the effectiveness of the installed eel bypass at reducing eel mortality. To do this, we use a technique called electrofishing to safely capture eel. Eel are then tagged by performing anesthetized surgery on captured adult eel, to insert an acoustic transmitter into them. Downstream, receivers are located around the dam and are able to track tagged eel as they approach and pass the dam. From there, we can determine which passage the eels used to migrate and can capture the number of tagged eels which safely pass through.